No knitting. Just beading... for the museum store in a local museum, as well as for my new etsy shop! Visit it! Well, although I have been doing SOME knitting, I have also been distracted by beading. 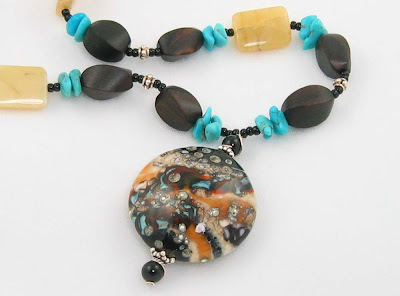 There is a small, local museum nearby that has been selling my jewelry for the past year, and it is now time for a new installment of my 'goods'. However, they have now asked me to design/ decorate the display case that my jewelry occupies, but it is a weird shape, so I have been racking my brain for ideas. I'll take a picture of the final result for you. I have not started any new knitting projects, in part because I ran out of yarn for the bulky sweater I was designing myself. I did order more, because I figured it related to 'stashbusting'... no need to leave a sweater unfinished, right? Plus, on Monday, both of the sock clubs I'm in will start mailing out the new kits... I know I'll get distracted by those, so I'm holding off. In the meantime, I have been knitting a bit on my lace shawl from the Victorian Lace book. I do 8 rows at a time, and then I need a little break. But it's okay.... I see it as more of a long term project anyway. Here is my rant: after many knitters made the request, Addi has put out a new line of lace knitting needles! However, I have read some reviews, and I think they did NOT make needles pointy enough to make me happy. One reviewer said that they were NOT as pointy as the Knitpicks circular needles, which I already own, and I would like something pointier! To be honest, I think I'd like a needle that was JUST shy of piercing my flesh. I guess I will NOT be buying them. But I would have. I really would have. Sigh. I didn't like the gauge of my experimental 'design it myself' sweater, so I decided to do the knitterly thing and pretend it didn't exist for the time being. I'll frog it and start over again, just not quite yet. Really. In the meantime, I fretted over what to knit next. (Important stuff, people, important stuff!) I reviewed the most current Knitty, and remembered that Argosy called for exactly two balls of Elsebeth Lavold's Hempathy, which is exactly the amount that I had left over from another project... yeah, I guess the directions for THAT one were a little generous on the yardage needed... but, Argosy is all the happier for it! Comments: I liked this pattern. It was easy to memorize, and I liked the cute squares and the diagonal knitting. I thought it was well written, and I would recommend this pattern to anyone. AND, I decided to practice knitting back and forth without turning the work, which made this even more entertaining! Partway through the project, I really felt like I had the hang of it, at least the knitting and purling part. I don't think I could be doing any additional stitches with much prowess yet... but this is a great skill to have for projects where you have to keep flipping your work every minute or so. I guess my technique is that I'm a 'thrower' when knitting forwards, then knit continental style on the way back. Interesting how that all works out. I would also recommend giving this a try if you haven't already! Those are the first few that came to mind. Truth be told, I got a million of 'em. Feel free to share yours, as well! I have been avoiding sewing the seams onto this sweater for a ridiculously long time, partially because I just hate seaming, but even more so because the edges of these lacy pieces were a bear to work with. However, I am fighting off a cold, and can't really think about going out to have fun (who would want to be near me! ), so home I sit. I thought about poor Cece working on Marmalade, which is beautiful but is tough going, and figured I could certainly bang out another UFO, sending it straight to FO town. So, the seams are sewn, and the cute little buttons are sewn on, too. I did an overnight block of the neck, and now she's ready to party! Unfortunately, I have a bad cold, so I look pretty darn terrible in this picture. Fortunately, Liz, the owner of Lush Beads, already has bronchitis, so we just coughed and hung out together eating Necco conversation hearts. I have already reviewed the project details for Miss Starsky, so all you get is a couple of pictures. 2. Figure out sweater specs by measuring a sweater I like. 3. Cast on appropriate number of stitches. Join. Knit in the round up to armpits, tossing in some decreasing and increasing to shape slightly. 4. Knit a couple of sleeves up to the armpit, looking at sweater that I like for reference. 5. Join sleeves and body in the round. 6. Figure out how much I need to decrease up to the neck, and decrease in raglan sleeve fashion evenly over about 8 inches. 7. Knit nice, long, snuggly turtleneck, and bind off. 8. kitchener stitch under the armpits; weave in the very few ends I have left, because I have been spit felting the ends as I go. Sounds like a reasonable plan, right? I am currently a little vague on the sleeve shaping up to the armpit, but I will examine a couple of sweaters that I already own and go from there. I am somewhat unsure about the yarn choice I have made, because it's a bit of an odd color... it was a super cheap closeout purchase from Webs online a couple of years ago. But, what better yarn to use for an experiment? I will naturally fess up and let you all know how it turns out. Wish me luck! At the end of 2005, I bought some closeout Berroco Duo yarn at the year end Webs sale. I also bought a pattern booklet and immediately went home and knit up a snuggly, bulky, big necked sweater. A BIG NECKED sweater. I swear I had gauge, I swear I followed the pattern, but the neck was seriously big enough to pull down over my shoulders. It was just plain silly. So, I did what any good knitter would do... I hid it away in the depths of my sweater drawer and pretended it didn't exist. Until the Stash and UFO Bustalong, that is! I have been slowly attempting to knit down some of my stash, as well as to tackle those 'well, that didn't turn out QUITE right' projects. Unfortunately, I could not manage to find the pattern booklet. And, once I frogged the giant neck, I realized that the sweater had not been knit in the round, and that I'd have to unseam the sleeves partway. Blecch. However, this yarn is so groovy, that I knew it would be worth the effort. I did a little math, figured out how much more I'd need to decrease in order to make the neck less gigantic, and got to work. I frogged down 14 rows of the sleeves and the front and back, and decreased every other row instead of every 4 rows, and that did the trick! Now, I have a big, snuggly, WEARABLE sweater! I am pleased as punch. In other UFO news, I ordered two zippers off of Zipperstop.com (a great place to buy custom zippers, especially if your mom has a sample booklet), which will be the finishing touches for Heather's Samus, and for my ancient Ribby Cardi, which predates this blog by quite a bit. I do not exactly look forward to sewing the zippers in, but it will indeed be cool to add TWO more to the FO list! I'm on fire, folks! I think there's a word that finishes that saying, but I don't actually know what it is. Anyway, all final touches are finished, and Starsky's collar is being lightly blocked. I am pleased as punch with the results. I think a slightly floppier yarn would have been a wee bit better, but I think this is a good project. I'll add a picture of me in it at some point... but this is always made a bit harder by the whole 'living by myself' factor! Needles: Denise Interchangables, sizes 6 & 5 (sized down from the suggested 10 and 9, in part due to the difference in suggested yarn, in part due to my loose knitting style). Not sure how many balls I used, because I forget how many I started with! Pattern Notes: Knitty labelled this as 'Extraspicy', and I think this was in part due to the fact that the pattern stitches were on the right and wrong sides. 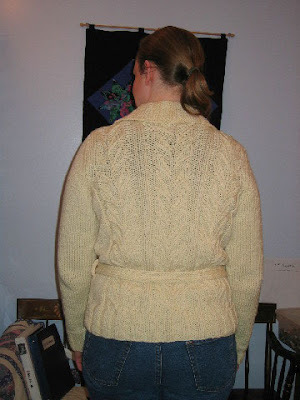 The pattern also included short row shaping, and a lot of small cables. However, the pattern was clearly written, with all of the different directions for the different sizes clearly marked. I did make one change: I shortened the sleeves because they were meant to be all super long... what do I need elephant arms for??? My final comment is that the short row shaping on the shawl collar is a super nice touch. Looks great! My final and most important bit of information about this pattern is that there is yarn left over! That means that I don't have to pirate yarn from my mom's Christmas Stocking... and that I can give it back to her! There is even yarn left over, giving me yet one more chance to think of a 'leftovers project'. Any ideas for about 300 yards of aran yarn? perhaps a very itchy cable knit hat??? Okay, I resisted for almost a week, but I broke down tonight. Allow me to introduce Po. I am adopting her. Sorry for not being able to include a picture here, but trust me. Follow the link. Adopt yourself a Po. Po is going to make me very, very happy. I am certain of it. I am also certain that Po will bring you happiness, too. 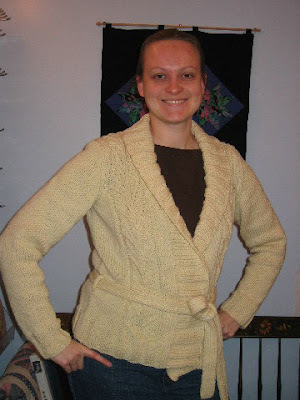 Well, Starsky is finished blocking, and yes, we did have a snow day today... so I knit the shawl collar... ALL DAMN DAY. However, I am now finally sewing up the seams, which appears to be a project I will not finish before bed time. I am trying to be very careful, particularly because it's a heavy worsted weight yarn, and I don't want the seams to be bulky... or, rather, any bulkier than they need to be. I feel confident that I will have a finished pic for you within the next couple of days. Sigh. I must return to hell... um, I mean, seaming my lovely sweater... and even when I'm done that, I still need to place the belt, knit up some belt loops, and probably block the shawl collar- the ribbing definitely needs to be softened up a little. ECCH! And yet, it's a groovy sweater and will all be worth it... Right??? Plus, it is the yarn that has been in my stash the longest, so it definitely deserves to be knit up during the stashalong! Maybe I Should Block First??? Here are the knit pieces of Starsky. Okay, once again, my cavelike apartment does not offer the best of photo taking opportunities... but if you can take my word for it for a moment, consider this: although the final circumference of the torso will be over 40 inches, the four pieces knit (including the SLEEVES) are a total of 24 inches wide! Yeah, I think I'm going to go ahead and block the pieces before any seaming is involved! The pieces are currently soaking. Once I sew the shoulder seams, I have to knit on a shawl collar. I figured it would be a LOT easier to do if the pieces were already blocked... I mean, look at that mess! For those of you who live in the general Eastern New England area, you are expecting what I am: to wake up to a pretty serious winter wonderland tomorrow morning! It is very possible that I'll get a day off from work tomorrow, and can knock out little miss Starsky- the blocking ought to dry pretty well, because I always set it up so that there is a fan pointing at it. Works pretty well. I was talking to Cece on the phone this evening, bemoaning the fact that my knitting progress on Starsky would have to be postponed while I blocked the pieces. She is trying to convince me to go back to Gibson Girl, which is merely lacking seams and buttons... but I promise I'll get to that... just not tonight! I mean, finishing touches (my least favorite) on TWO items in one night? Not gonna happen. Maybe soon. Real soon. And more specifically, i-cording. I have been a knitterly whirling dervish, and have knit and seamed the Samus. I also just finished the i-cord around every single edge... and man, that is a LOT of i-cord! Luckily, the sweater is for a wee individual... it could have been a whole lot worse! Now, I need to find a matching zipper. Luckily, my mom (and dad and grandma) is coming down for a visit tomorrow, and my mom is a bit of a sewing buff. She sent away for the YKK zipper catalogue, and I will be able to get a perfect match! I will simultaneously pick out a zipper for my ribby cardi, and boom. A little zipper sewing, and two more items finished! I guess I'll save the project recap for when I actually and officially FINISH the above Samus. Sounds fair to me, no? To those of you who wished me a happy birthday, thank you! My parents called me and sang to me while I was at work, and it was truly hilarious. Um, I mean, the beauty of the melody did not resemble cats being tortured AT ALL. Not even a bit. A big thanks goes out to Kate from the Bustalong, for making a pair of these and giving me the inspiration to make a pair of my own! Note: The color in real life is a bit more pleasant and mocha. Yarn: Cascade Fixation in color # 7988, two balls with not much left over! Project Notes: I liked this pattern, and the undulating wave pattern was very pleasing to me. It did feature short row heels, which I generally don't enjoy knitting, but on the second sock, I messed around with knitting and purling through the back loop (where it made sense), and I liked the way it looked a lot better. Cool. Last night, I went out for an AMAZING pre-birthday meal with my friend Heather at the Elephant Walk in Boston. I took the commuter rail down, and brought these with me to work on. However, I realized once I pulled the project out that I had forgotten the pattern! However, after a bit of head scratching and really taking a look at the sock so far, I realized that I had memorized the pattern! It actually made the knitting go a lot faster! I wonder how often I make things harder for myself because I just rely on the pattern? I am going to pledge to you all that I will try harder to be a more intuitive knitter. You heard it here first, folks. I am going to take a brief break from socks and work on something different next... this is particularly important because the two sock clubs that I joined will be mailing kits to me mid-month... so, yeah, I will be knitting socks in a couple of weeks anyway! As far as what I'll knit next... I haven't decided quite yet. I'm going to go stash diving and figure it out. I know, I know... the sock knitting thing is getting tiresome, particularly considering the fact that I have other, non socky things that are so close to becoming completely finished projects! However, I just can't seem to help myself. And hey, I'm still working off of stash yarn, so it's all good. Okay, I might be slightly exaggerating their awesomeness, but they are pretty great. The pattern features a short row heel, which in general I am just not a fan of knitting. It seems perfectly fine for wearing, though, so it's all good. I'm bustin' a move on sock #2, and will be wearing these mocha-tastic socks in no time!